The 10th annual British Pie Awards took place just a few short weeks ago and we were delighted to once again be there for judging and full media coverage via our Live feed! Held in the heart of pork pie country - Melton Mowbray - we saw a record 146 judges rate a record 963 pies from across Britain! And we were delighted to share on Day Five of British Pie Week that the British Pie Awards Supreme Champion of 2018 was Turner's Pies! Back to the Awards judging on Wednesday 7th March and we were glad to be back where it all began as the 10th annual British Pie Awards headed home to St Mary's Church in the heart of Melton Mowbray. 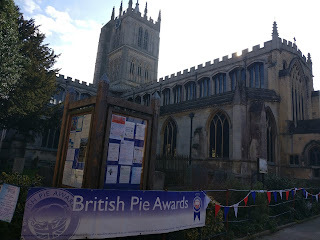 You may remember that last year the Awards took place at an alternative local venue while the church was refurbished but I can confirm it was well worth the wait, as the new renovations looked great and the church really is the home of the Pie Awards! After a three hour trip from Gloucester to Melton Mowbray via Birmingham, Pierateers Sam and Rob, ably accompanied by friend of the Pierateers Ben, arrived for the 10th annual British Pie Awards. It was the first time we'd driven to the Awards and after a light breakfast and coffee upon arrival, it was time to head to see the newly refurbished church. We weren't disappointed! And having settled in, it wasn't too long before new chairman Colin Woodhead conducted the all important judges briefings, where consistency in judging was the main point stressed to the judges. Then it was over to Chairman of the Melton Mowbray Pork Pie Association Matthew O'Callaghan to welcome people and share a few top tips about judging, before the Vicar of St Mary's church in Melton Mowbray blessed the pies with a brief prayer, thanking the pie makers for all their hard work in baking! Amen to that!! There were once again a number of celebrities judging the pies, in particular TV's Andy Clarke on the Pork Pie Class and food critic Charles Campion. 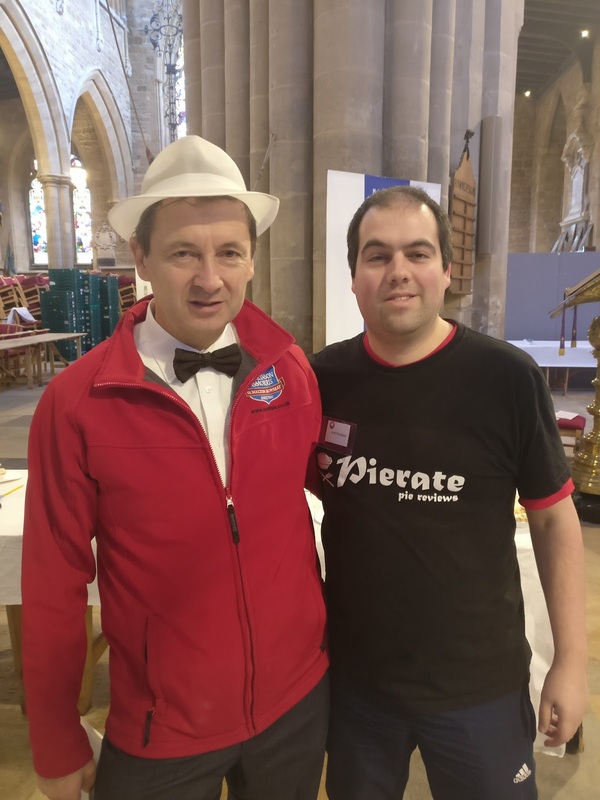 And we were delighted to catch up with a number of friends of the blog such as Katie "AwayDayPieGirl" Peel and "Life of Pies" author Martin Tarbuck, as well as Awards hosts Matthew and Stephen Hallam. 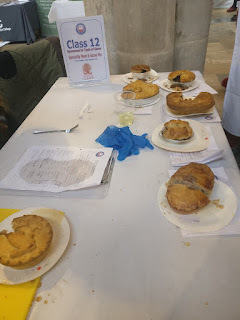 As always there were a number of interesting occurrences, such as controversy in the Savoury Pie (cold) class as a pie with a stilton lid - rather than pastry - got disqualified and a chicken and banana pie was rated in the Chicken pie class! Plus there were once again some interesting flavours in the Speciality Meat and Game Pie class. Rabbit, venison, wild boar and duck pies were among the entries there! - As previously mentioned, Turner's Pies from West Sussex grabbing the big prize - the Supreme Champion 2018 for their Steak and Ale pie. This was also followed up with the win in the small producers award category too! Many congratulations to them - we look forward to getting our hands on one to rate soon! - Lesson Family Butchers winning the Melton Mowbray Pork Pie class. 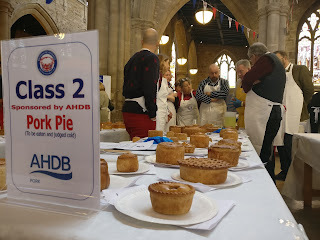 This was a turn up for the books, as last year the Supreme Champion was from this class, but this year the Dickinson and Morris Pork Pie didn't even win the class! - Ben's Kitchen - who won the small producer award last year - won the Beef and any flavour class for their Beef Bourguignon pie. - The Speciality Meat and Game pie class was won by Stanbury Wild Game Pies, whose pies we ate at the end of British Pie Week (see Day Six and Day Seven reviews) and which will be formally rated in the next week. 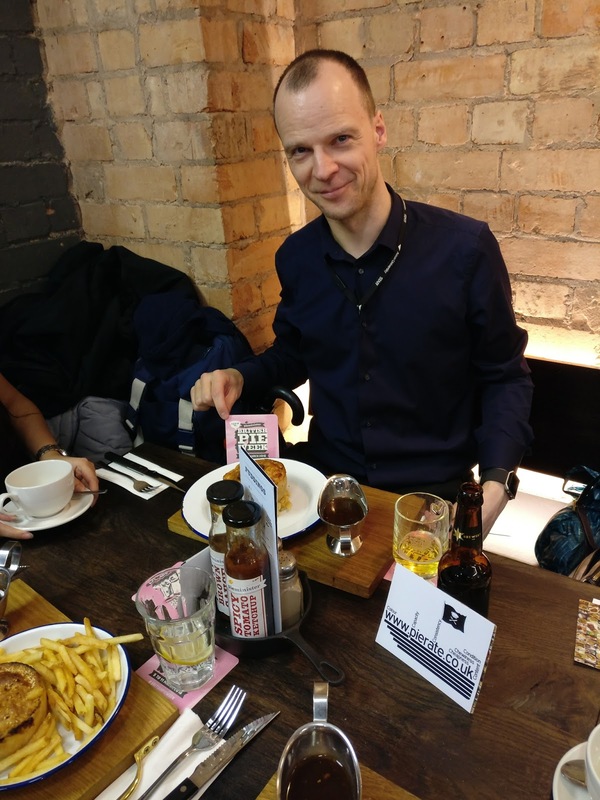 - The Apple Pie class was won by none other than Graham Aimson, whose name may well ring a bell as in the past he won the class (and Supreme Champion) when working for Morecambe FC but this year won the class while working for Kendall Rugby Club! 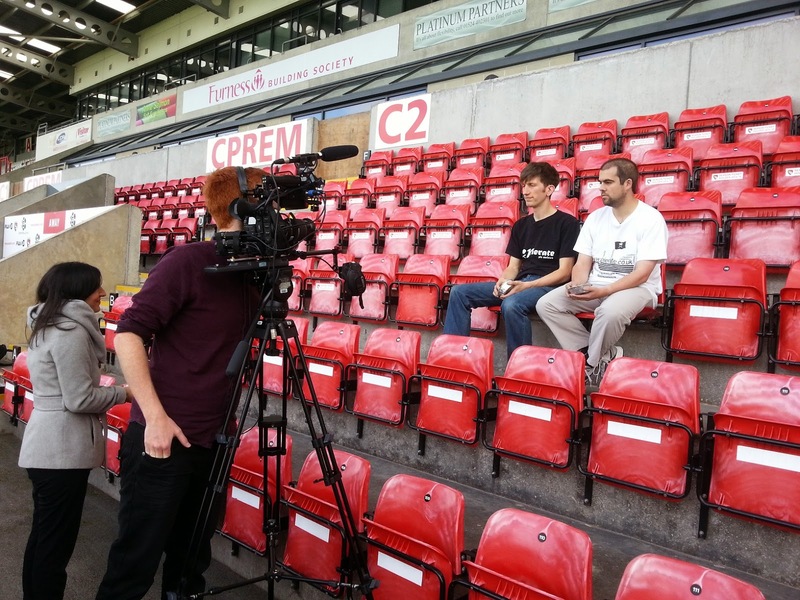 Find out more about Graham's transfer here. 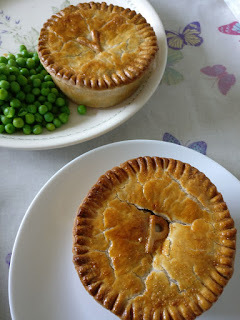 The full list of winners can be found on the British Pie Awards website. Once again there was a great array of top pies made from hundreds of pie makers (many small producers of less than 5 employees!) It certainly reminds us we have many more pies to set sail towards on the Pierate Ship! We'll keep searching these Great British Isles for more top pies and, as always, let you know how they all rate on the 7 Cs of pie rating!! 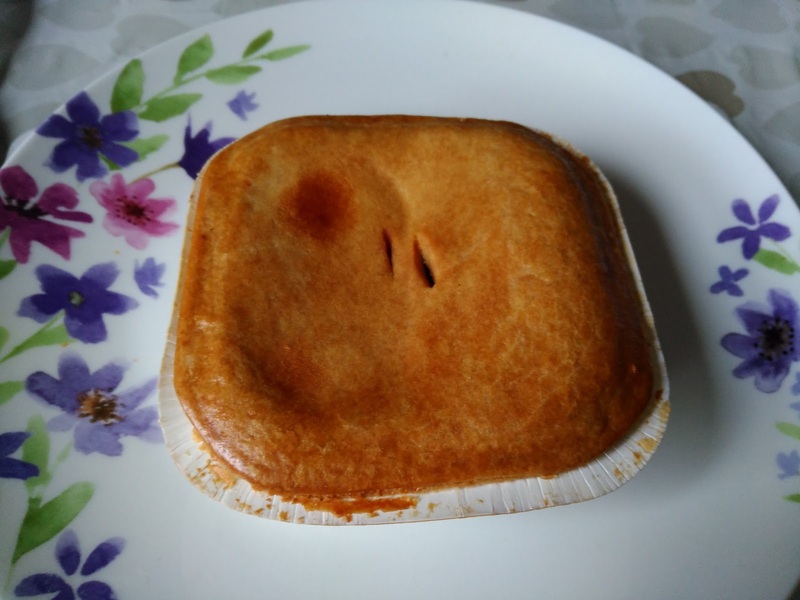 continue reading "British Pie Awards 2018"
continue reading "Football's greatest (pie) save?!" 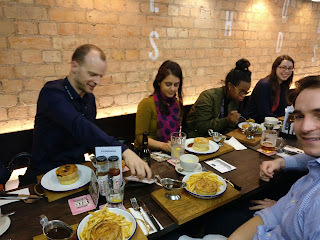 As part of our Pie Pledges for British Pie Week last year, we decided to head up to Leeds to do a #LeedsPieTour! A bit delayed but we have finally caught up with this being the all important last place we really had to review! 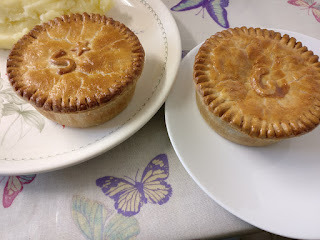 As part of the Leeds Pie Tour one of the most highly regarded pie shops we visited was Wilsons. Some claimed that they produce the best Pork Pies in Leeds so we had to check them out! It was nice to see that this was a shop specialing in pies which goes to show how much the good people of Leeds love their pies. As you can see from our video, I devoured the pork pie straight away having gone for the hot option. 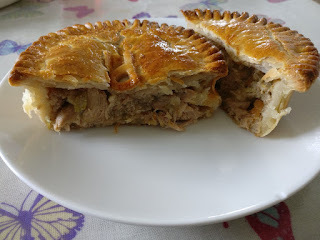 As a Southerner, a hot pork pie is not something I would normally choose but I thought I had to give it a go. Unfortunately it made it hard to compare it to other pork pies I have eaten. The pastry was certainly nice with a crunch on the outside but nice and moist in the middle. It was a bit softer than normal because it was hot. I liked how the jelly had melted, I don't particularly like the cold jelly layer in a pork pie but when hot it makes more sense. It did take me a bite to get through to the central pink ham meat. The filling was moist and certainly not lacking in flavour. I really enjoyed the first couple of bites but then found it got a bit sickly. I am not quite sure why this was, perhaps it was because there was quite a lot seasoning. I think it was a good pork pie but I prefer the cooked pork you find Melton Mowbray pork pie whereas this was cured meat; like eating a lump of ham. It was actually quite similar to the Voakes pork pie we had at Haley & Cliffords but I thought slightly not as good. However I was more in my comfort zone with the Voakes pie because I had it cold. I also picked up a Wilson's Steak pie which TJP and myself ate hot later on. This was of course very different to the pork pie. 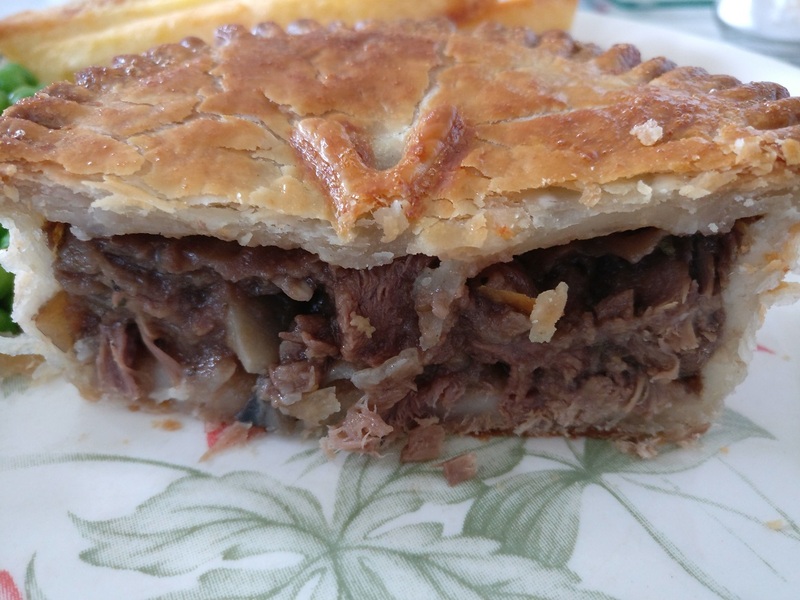 The flavour of the filling was fairly standard Steak & Ale territory. The whole thing was moist because there was plenty of nice thick sauce. It was well filled with big chunks of meat although some were a little chewy. 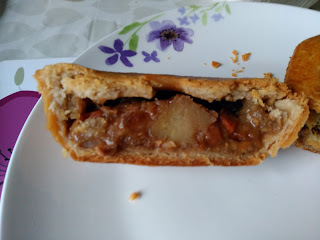 The pastry was not your standard hot pie pastry, this was thick and in some ways a little dry but this did mean it had a good crunch and an almost biscuity flavour. It was quite nice to have this as a change to the soft and stodgy pastry you get with mass produced pies. 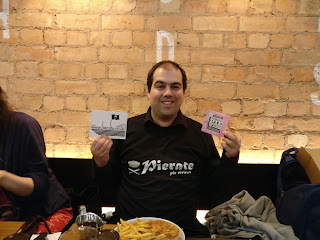 Overall I enjoyed the pie and it was great value. 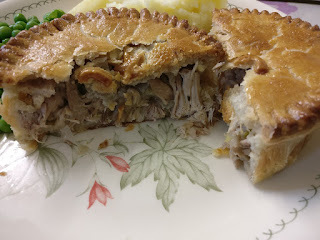 I note that I also picked up a Meat & Potato pie which really wasn't as good so stick with the Meat & Meat! continue reading "Leeds Pie Tour: Where There's a Wilson's, There's a Way"
continue reading "Birmingham Pie Night celebrated at Pieminister!" continue reading "7 ways to survive post British Pie Week"
continue reading "British Pie Week 2018 - Day Seven"
continue reading "British Pie Week 2018 - Day Six"
continue reading "British Pie Week Reci-pie: Pasticcio di Maccheroni (Pasta Pie) "
The results of the 10th annual British Pie Awards are the headline of Day Five of British Pie Week. We were delighted to be able to judge and provide media coverage of the Pie Awards with friend of the blog Ben (who was judging for the first time) and would like to officially congratulate Turners Pies on taking home the Supreme Champion award this year! More details below and a full summary of all the results will be coming next week! With hundreds of you following our live blog of the British Pie Awards 2018 - Live! on Wednesday, it's clear that there's an ap-pie-tite for top pies and knowing who will be crowned the Supreme Champion out of the 960 pies that were rated on Wednesday! So without further ado, we are delighted to announce that the winner of the British Pie Awards 2018 is Turner's Pies Steak and Ale pie with Highland Top Rump and Dark Ale. 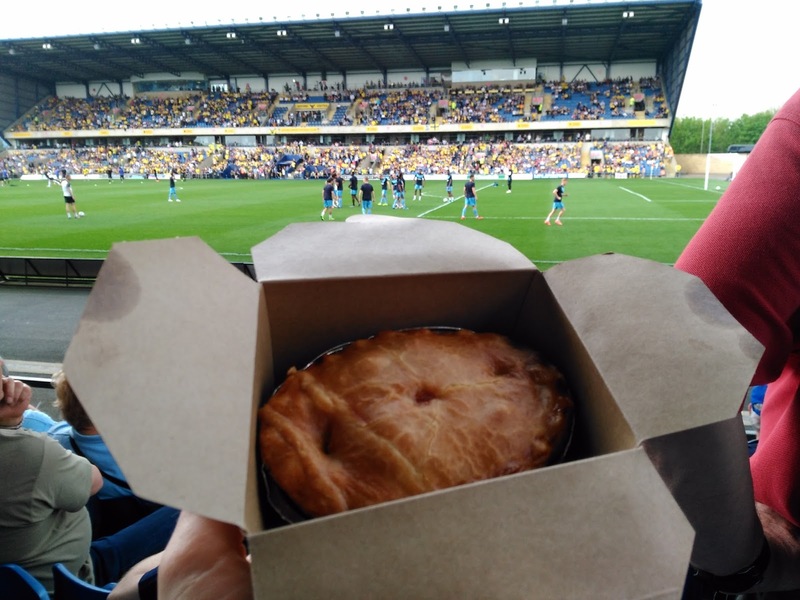 And after their win yesterday, Turner's Pies immediately set their eyes on another award - this time becoming the number 1 pie on Pierate! 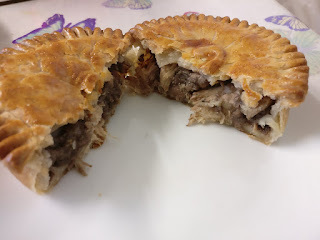 After an oven failure unfortunately meant we never got to rate the pies we obtained from Turners a few years ago, we certainly need to get our hands on them now following their Supreme Champion win! We'll make that arrrrghhh mission in the coming months!! continue reading "British Pie Week 2018 - Day Five"
Day Four of British Pie Week always feels like a bit of a lull each year, coming between the judging of the British Pie Awards on the Wednesday and the results being announced on the Friday. 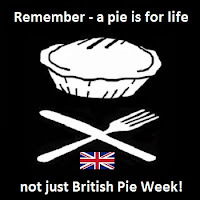 However there's still plenty of pies to eat and a great landmark to celebrate today on the Pierate Ship! With all bar the pie eating completed in terms of my #PiePledges it was a bit of a quiet day on the blog and twitter, in part due to sad news in the family with the passing of my gran this morning, so I dedicate this post to her memory. Something that put a bit of a smile on my face on Thursday evening after quite a hard day was seeing the amazing response to our blog on the Wednesday and Thursday, with over 20,000 views of our Radfords Pie Review on Wednesday (our most hits on an article in one day in Pierate history!) 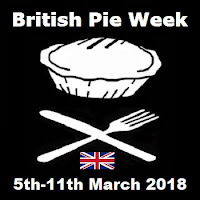 and thousands more of our British Pie Awards 2018 - Live! article and other pie week posts meaning that by Thursday night we had officially passed 900,000 views!! It's quite amazing to think that what started as a little bit of fun from a punny name has spawned into the world's leading pie review blog that is now under 100,000 views from a landmark 1 million views!! Thanks to everyone who has even glanced over just one of our articles, making it what it is today! The pie of the day was this Bowen's Steak pie and Steak and Stilton pie, which I hope to review later in the week. We've already pie rated the Steak pie as Pierate Highly Recommended, and will review the Steak and Stilton soon! 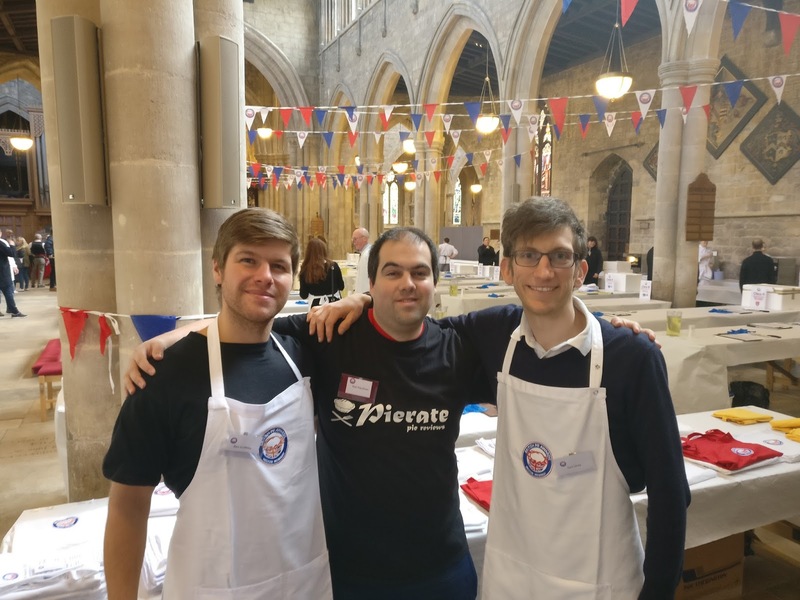 continue reading "British Pie Week 2018 - Day Four"
As for the Pierateers, we are ready for probably the biggest British Pie Week yet! 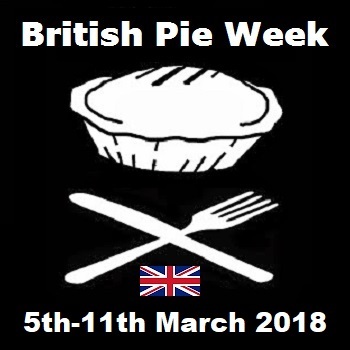 We've made Pie Pledges for this week in our Friday Pieday Pie Week Special, showing our commitment to pie, plus this year the British Pie Awards 2018 are once again taking place today in British Pie Week! We'll be there as media to cover the event and Pierateer Sam will be judging again. On Day Three of British Pie Week all eyes were on Melton Mowbray for the 10th annual British Pie Awards, which both Pierateer Sam and I were attending. Sam was there to judge the Savoury Pies (Cold) class and I had taken the day off to provide live blogging of the greatest show in pies! We will be writing up the results of the British Pie Awards 2018 after the results are out on Friday. 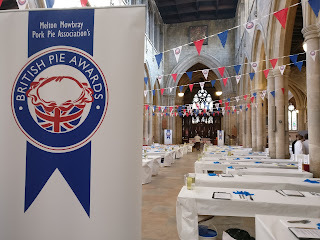 However for now you can check out our @pierateers twitter feed for photos from the British Pie Awards, a number of which are also viewable on our British Pie Awards 2018 - Live! article. 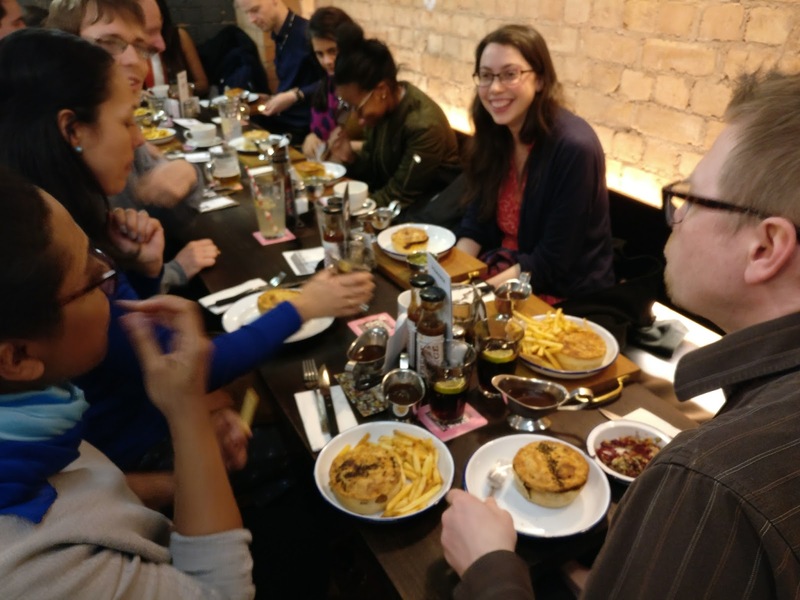 continue reading "British Pie Week 2018 - Day Three"